Hello everyone! I hope that your New Years was more fabulous than the thought of a rendition of "Lion King" reenacted by puppets made from vegetables! 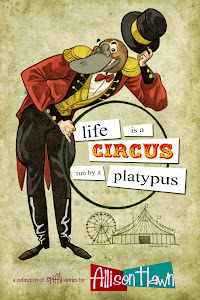 Well, exciting news, "Life is a Circus Run by a Platypus" has been nominated for The Peoples' Choice Award through Acclaimed Books! As the title would denote, it is an award that is given to the book that can get the most amount of votes of those nominated for that month. In honor of the new year and this nomination (and yes, a little shameless bribery as well), I have decided to drum up a little contest. All you have to do is click on the link and vote for my book before the end of January and then mention that you did so on the post pinned to the top of my Facebook Page. Really, that's all you have to do to enter! What are you entering yourself to win? 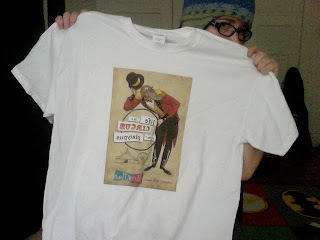 A "Life is a Circus Run by a Platypus" shirt! Disclaimer: This contest is for the shirt. 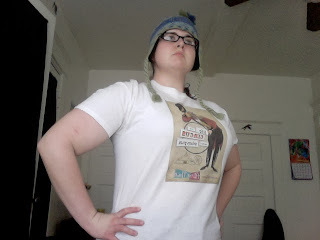 Hat, glasses, implied pants and author not included. So vote, then tell me you've done so and enter to win an awesome shirt! As always you can follow my madcap exploits on Facebook, Twitter and Goodreads!